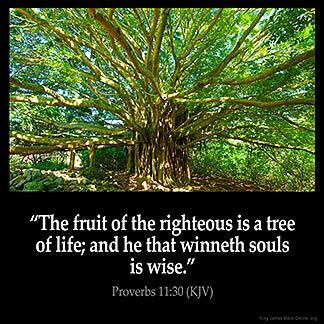 PROVERBS 11:30 KJV "The fruit of the righteous [is] a tree of life; and he that winneth souls [is] wise." 27He that diligently seeketh good procureth favour: but he that seeketh mischief, it shall come unto him. 28He that trusteth in his riches shall fall: but the righteous shall flourish as a branch. 29He that troubleth his own house shall inherit the wind: and the fool shall be servant to the wise of heart. 30The fruit of the righteous is a tree of life; and he that winneth souls is wise. 31Behold, the righteous shall be recompensed in the earth: much more the wicked and the sinner. The fruit of the righteous is a tree of life: and hee that winneth soules, is wise. 11:30 The fruit - His discourses and his whole conversation, is like the fruit of the tree of life. Winneth - That gains souls to God. I believe the fruit that the Lord is talking about here is the fruit of my mouth : What am I saying ? I ask myself : Am I speaking words of life to an individual and myself so that it will turn them to the Lord Jesus or negative words that bring death and destruction. Life and death is in the power of the tongue. It is the wisdom of God to bring forth life and healing to a lost and dying world and to our fellow believers and myself. And ourselves. My tongue controls my ship where I want it to go !!! The Basic English Bible translation is jarringly different from the other translations, and in my opinion, wrong how does it get "violent behaviour takes away souls " from "he that winneth souls is wise "? Compare with all of the other translations. Where did the violence them come from? How could Basic turn a basically evangelic verse into such a negative expression? PEOPLE OF INTEGRITY,HONOR,and GRACE are better off than the wicked,in the short and long run.